Ghauri Town is located in Islamabad Zone IV which is very close to the Benazir Bhutto International airport. You can also access it from Main Lehtrar Road via Ghauri Garden Road. Ghauri Town is the project of Raja Ali Akbar and Chaudary Abdur Rehman company. The recent project by Ghauri Town is Phase 7 where development work is on the way and the rates are relatively low then the adjoining areas. First 5 phases of Ghauri Town are situated on both sides of the main road that passes through the Ghauri Town. It has a fully functional commercial market, providing all the needs and luxuries to the residents of Ghauri Town. The commercial market is at the 10 minutes’ distance from all the 5 phases. Phase-7, in Ghauri Town, is quite different than other phases with respect to location and facilities. Phase-7 is separated from other phases of Ghauri Town. It has its own beautiful entrance. Phase-7 offers wide roads and ideal location of residential and commercial plots. 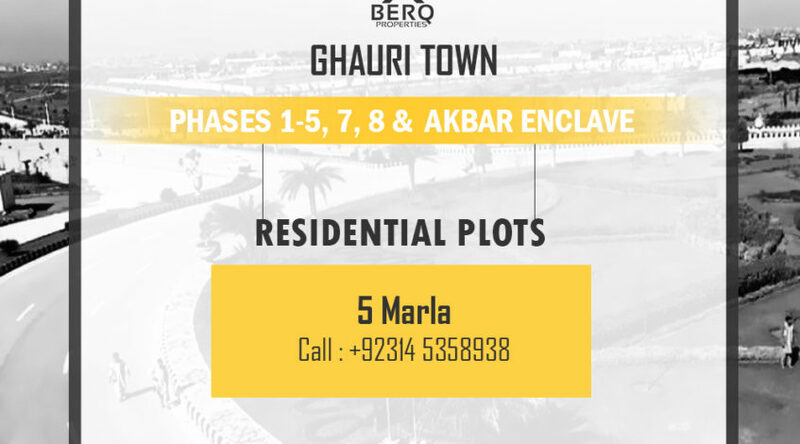 Akbar Enclave is also a part of Phase-7 to Ghauri Town. There are also wide roads and clean environment inside Akbar Enclave. It has residential and commercial plots on attractive locations. Rehman Residencia is a project of Ghauri Town phase-7. This is more advanced project than other phases of Ghauri Town, with better facilities and development plans. Roads are also better and the location is very attractive as it is far away from the Drain. Tulip is a long belt along the right side of the entrance gate of Rehman Residencia. This is very attractive location. Tulip has residential and commercial plots of 5 Marla. Rose is a long belt along the left side of the entrance gate of Rehman Residencia. There are residential and commercial plots of 5 Marla in Rose. The location is very striking as it is situated right at the start of Rehman Residencia and end of Akbar Enclave. Phase 8 has both residential and commercial plots. Its map is already been launched. The location of Phase 8 is adjacent to Gulberg Greens housing society. In addition to that, this phase is on height as compare to others phases.